Win over your very own Christine as Erik in the Fantasma dell'opera - Gold - Phantom of the Opera Italian Mask. 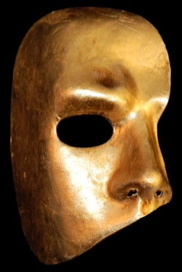 Our Phantom masquerade masks are hand made in Italy and feature a vertical half mask brushed in shiny gold paint. 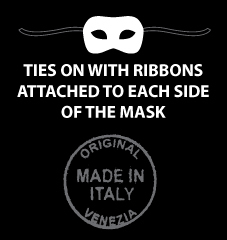 To complete our Venetian masks, our Italian artists add ribbons on the sides for tying. Our Phantom of the Opera Venetian Masks are created based on the novel of the same name. As the story goes, Erik wears a half mask to cover the part of his face which resembles a rotting corpse. Wear our Phantom masquerade masks to your box seats at the opera, with formal wear for a masquerade party, or pair it with our hooded cloak for a Mardi Gras celebration.